[I spent] less chair time delivering the product. It makes a pulpotomy much easier to fill and more predictable. [The particle size was very fine and allows a smoother flow of the material when inserted to the fine gauge tip sizes of the syringes. With bioactive properties that promote healing, mineral trioxide aggregate (MTA) has proven to be an excellent repair material in endodontic treatment. But MTA cements are not known for their ease of use, often proving difficult to mix, handle, and deliver without sticking to instruments or making a huge mess. 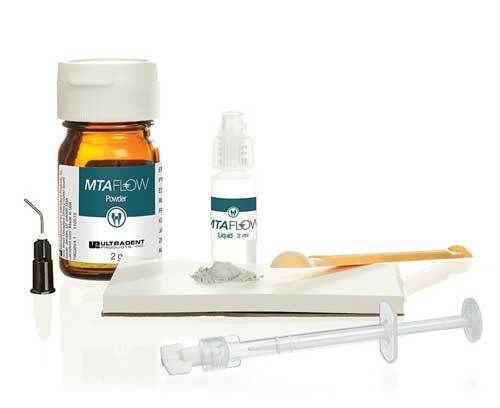 To address these concerns, Ultradent formulated MTA Flow dental repair cement with ultrafine-grained powder and an exclusive water-based gel mixing medium. The combination quickly and easily mixes to a smooth consistency and desired thickness and is easy to express through a very small tip. 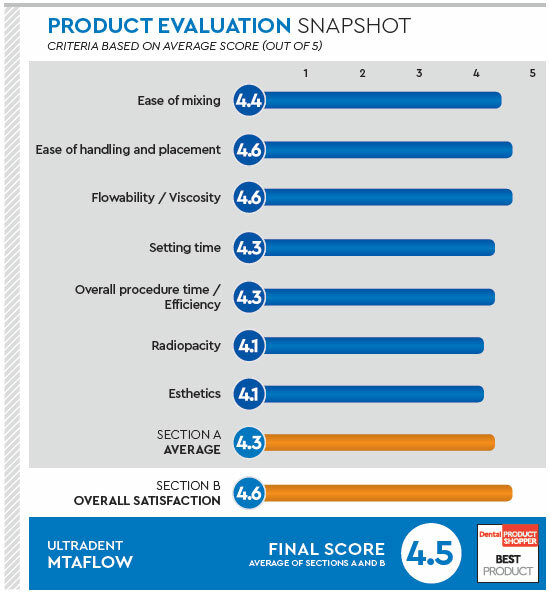 When endodontist Grace Chu agreed to try Ultradent’s MTA Flow dental repair cement for this Dental Product Shopper evaluation, she was hoping the material would be easier to deliver than some other MTA cements. She discovered, “The particle size was very fine and allowed a smoother flow of the material when inserted to the fine gauge tip sizes of the syringes,” adding that the low viscosity of the material allowed her to use a finer tip, which improved the efficiency of the delivery, especially when inserting into the apical third of the root. MTA Flow mixes quickly, smoothly, and easily into the right consistency for a variety of procedures. It can be mixed to various textures by changing the ratio of the powder to water-based gel and is delivered using Ultradent’s syringes and tips, ensuring precise placement. When mixing an MTA material, Dr. Bruce Schulman said he normally has a lot of variation in formulating a consistent mix. After mixing MTA Flow, he called the consistency “amazing, with much more consistent mixes.” From apical plugs to retrograde fillings to perforation repairs, Dr. Schulman was “so much more efficient in arriving at a consistent mix for variable uses.” Calling it a “faster, easier material to mix,” Dr. Alan Sedell used MTA Flow for several lower molar apicos and shared, “It made the apicoectomy procedure a bit less stressful due to its ease of use.” Dr. Anthony Gadbois said it was a “much easier way to dispense MTA,” Dr. Jeremy Lowell lauded its “wonderful delivery system,” and Dr. Nathaniel Behrents said the different mixing possibilities allowed him to adapt the product to his needs. The powder’s small particles (less than 10 microns) combine with the water-based gel to form a smooth, non-gritty consistency. The mixing ratio of the powder and gel is adaptable with a thick consistency for pulp capping, pulp chamber perforation, and pulpotomy; a thin consistency for resorption, apexification, and apical plug; or a putty consistency for root end filling. While most evaluators appreciated the quick setting time, Dr. Chu said she sometimes had to make two mixes – one flowable and one putty-like. “It didn’t give me much working time when I had to use ultrasonics every few increments and condensed the material,” she shared. Dr. Lowell said he spent less chair time delivering the dental repair cement, another dentist said it reduced the overall treatment time, while Dr. Behrents pointed out that the tube was difficult to load.